Is there such a thing as a case of the Tuesdays? 'Cause if so, I got one. I don't know about you but today was kinda blah. Mercury's in retrograde (yes, I just love Astrology) and everyone seems to be coming down with the old change-of-seasons cold. I'm not complaining (or am I? ), but there just seems to be a collective sense of fatigue in the air. After work, as I plopped onto my couch, cooking dinner was dead last on my list. Thankfully, it didn't take me long to remember that today's meal plan involved a recipe that's as easy and fast as it gets. Better yet, our Smoked Salmon Avocado and Scallion Brown Rice Bowl is packed with Super Foods and healthy nutrients - all in one low-cal package. Anything less and I'd have been on that phone for takeout in a jiffy. Our quick dinner is adapted from a wonderful recipe I spotted on Food & Wine's Blog as part of a series called The Food & Wine Diet. Like, hello! Sounds like my kinda dieting! Anyways, this clever spot showcases healthy recipes that are "all created to pair with wine (a 5-ounce glass has anywhere from 110-150 calories) - all for 600 calories or fewer." Should you choose to add the suggested wine pairing to this dish, author Kristin Donnelly recommends Riesling. We're skipping the wine tonight, but you certainly don't have to! Without a glass of the good stuff, this recipe probably comes in somewhere in the neighborhood of 400 calories and 17 grams of fat per serving. It also happens to be very delicious. Our changes to the original recipe were made both to suit our tastes and use some of the ingredients in our fridge. I subbed out cucumbers for zippier scallions and shallots. Alliums, or vegetables in the garlic and onion family, not only offer major health properties, but they definitely add the interest in this Asian-inspired rice bowl. When used raw, they are at their most potent. By the way, I love cucumbers so I am sure they would be a very welcome addition that you could definitely add back in. Now for the protein - smoked salmon is easy to buy in advance and have on hand in the fridge. A three-ounce package is the perfect amount for this dinner for two. Finally, because I always aim for a bit of extra flavor, we added a very modest splash of low-sodium soy sauce along with a few dots of sriracha for spice. We skipped the nori because it's not in our every day pantry. Cool Avocados round out the flavors of this surprisingly satisfying dish. To make this recipe in under 10 minutes, you'll either have to have your preferred grain or brown rice ready-cooked, or just take our recommendation and use our favorite, Uncle Ben's Ready Rice. It cooks in 90 seconds in the microwave and comes in two-serving portions. The stuff is a lifesaver. I hope you enjoy this tasty and fast recipe, as well as all the extra time it will give you to relax and recharge. 1. Pre-cook your rice or grains, or place your Ready Rice in the microwave (follow package directions). You can heat your Ready Rice up just after you've finished chopping all the other ingredients. 2. In a small bowl, combine Scallions and Shallots (and Cucumber if using) with the Sugar and a 1/4 teaspoon of Salt. Toss. 3. In another small bowl, mix the Avocado with the Lemon Juice and stir gently. 4. Scoop the Rice into two serving bowls. Drizzle each with a 1/2 teaspoon Low-Sodium Soy Sauce and mix. 5. Top each rice bowl with Avocado, the the Scallion and Shallot mixture, and finally with the Smoked Salmon Strips. Give it a gentle stir and dot with optional Sriracha and sprinkle with Black Sesame Seeds. Serve and enjoy! Since I am enjoying an uncharacteristically good run of baking success (remember our Apple Cheddar Hand Pies? ), I figured I might as well go for broke. This means ... it's test kitchen time! Today, we're baking a classic Italian sweet - the Pignoli Cookie, and it may as well be the ONLY Italian Cookie in the world, because it is just THE BEST. The word "pignoli" means pine nuts in Italian, and these little nuts provide the key ingredient for our truly sinful cookies made of sweet almond paste and sugar. The combination is pure simplicity, and the taste and texture - well, they're indescribably good. 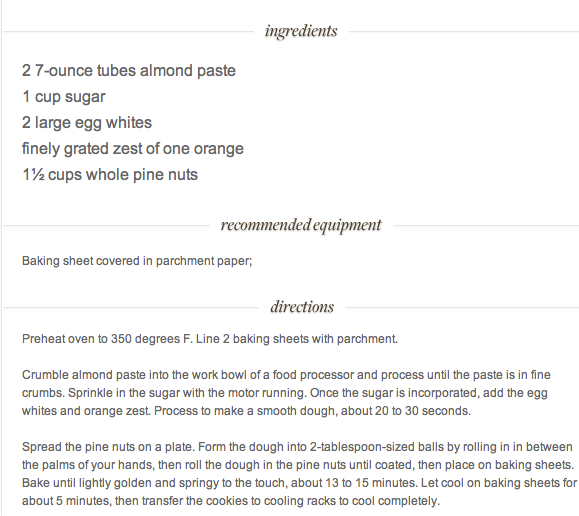 Once I decided to set out to make pignoli cookies, my next conundrum was which recipe to use. What better source to turn to than one of my favorite classic Italian cooks, Lidia Bastianich? She's my go-to for most authentic Italian recipes. As you may have gathered, I consider pignoli cookies to be insanely delicious, but it does bear mentioning that the ingredients required to make them are quite pricey - the pignoli nuts themselves a major culprit in driving up the cost. Buying pignoli nuts in bulk is a good tactic, as they are super versatile in both sweet and savory dishes (use them to top salads or even as an addition to pasta sauces). Lucky for me, my mom hooked me up with a sweet half-pound box of nuts from Pastosa in Brooklyn. The cost was ten dollars, but that's actually a pretty competitive price for these little guys. You can find some good deals on Pignoli Nuts on Amazon. I've also used the Trader Joe's Brand Pignolis available there. The second major ingredient, almond paste, which I purchased at Kalustyan's (an NYC treasure in the form of an amazing spice superstore), wasn't cheap either. Nine dollars a tube to be exact, and this recipe requires two of them! For those of you not located in the New York City area, almond paste (the same stuff used to make marzipan), is readily available in gourmet and specialty food markets. So - pignoli cookies are expensive indeed - but you must trust me that they are worth it. Just a few ingredients and basic steps also means that these cookies are easy to make - even for the baking challenged like myself! Soft and chewy in the middle and studded with crunchy, savory nuts on the outside, they really offer something for everyone. Oh, and they're versatile too; you'll find them a welcome accompaniment to your breakfast coffee as well as a tasty component of any light dessert. A side of hazelnut gelato, anyone? Better yet, their shall we say "special" ingredients make these cookies a fitting hostess or even holiday gift. Did I mention they're the ultimate Christmas cookie? Equipment-wise, you'll need a stand mixer with a deep bowl or a large mixing bowl with a hand beater. With Lidia's guidance, my cookies came out positively delectable, however I will note that I cooked them a bit longer than she recommends, as mine seemed a bit less than "springy to the touch" after 15 minutes. I also cut the sugar in half (a half cup of sugar total) and they were perfect. I let them cook about 16 minutes but I would recommend checking them around the 13 minute mark since ovens can vary greatly. When the pine nuts turn golden, they're probably ready. Additionally, make sure to let the cookies cool a good 10 minutes before trying to remove them from the parchment paper or the middles will stick. Allowing them to firm up on a drying rack is also key. You could certainly bake these longer for a crunchy cookie if that suits your tastes, but for me, half the goodness of a pignoli cookie is that it is slightly chewy inside. Optionally dust the finished product with confectioners sugar for a more beautiful look! Ok - now we're ready to bake! PUMPKINS - they're back, and they're everywhere. Like most home cooks (and avid eaters), I'm happy that pumpkin season is officially in full effect. Pumpkin is an extremely versatile flavor, as good in savory preparations as in sweet, and oh so good in beer, coffee, even cider (I just had this pumpkin flavored hard cider the other night and thought it was so good). Today's pumpkin-spiked dish is as simple as it gets. Ready in well under twenty minutes, you can easily incorporate Pumpkin Mascarpone Orzo into your fall dinner party repertoire as an entree or appetizer. Serve it to guests in a fresh pumpkin bowl as shown below for extra wow-factor, or hoard this decadent dish all for yourself -- we won't judge! Either way, you won't be sorry. Using canned pumpkin makes this recipe fast, accessible and seasonless, while the addition of creamy mascarpone cheese (which is pure, glorious sin, by the way) means the result will be irresistible. 1. Set a pot of well salted water to boil for your Orzo. 2. In a bowl, combine the Pumpkin, Mascarpone, Cinnamon, 1/4 teaspoon of Salt and 1 teaspoon Sugar. Mix well. 3. In a large skillet over a medium-low flame, melt the Butter. Add the Shallots to the pan and sauté, stirring, for about 4 minutes. They will have softened but will still have a little crunch. 4. By this time, your pasta water should be boiling. Add the Orzo (you'll need it to cook for 10 minutes). 5. Meanwhile, pour the Pumpkin mixture in the skillet with the Shallots. Stir. 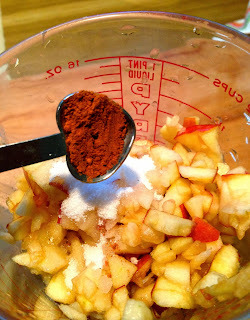 Add 2 Tablespoons of water to the Pumpkin mixture - or more if you like it a bit thinner. Turn the heat down to low. 6. When Orzo has cooked for 10 minutes, drain it and add it to the Pumpkin skillet. Toss gently to incorporate and sprinkle with chopped sage. Taste for Salt and adjust to your liking, keeping in mind that the Pecorino Romano will add some saltiness. Plate the Orzo and finish with freshly grated Pecorino Romano. There's something kind of perfect about a rainy Sunday. A license to cancel all your chores and plans, this is the kind of day that practically invites you to relax on the couch, savor your cup of coffee that much longer, and read the paper at a snail's pace. If all that sounds too taxing, you are more than welcome to have a little nap. As I always say, don't mind if I do. On a days like this, a slow cooking, comfy and easy meal always seems to me to be in order - so that's just what I set out to do yesterday evening. The only question was - what to make? When I am in relaxation mode, I like to ensure that my cooking is even simpler than usual. Since I had resolved to brave the elements and go to the store in the rain, my goal was to make my grocery errand extra quick by planning a meal with just a few ingredients, many of which I already had on hand in the fridge and pantry. In just an hour and a half, you too can make this beautiful entree and comforting dessert of Milk-Poached and Roasted Chicken and warm Apple and Cheddar Hand Pies. 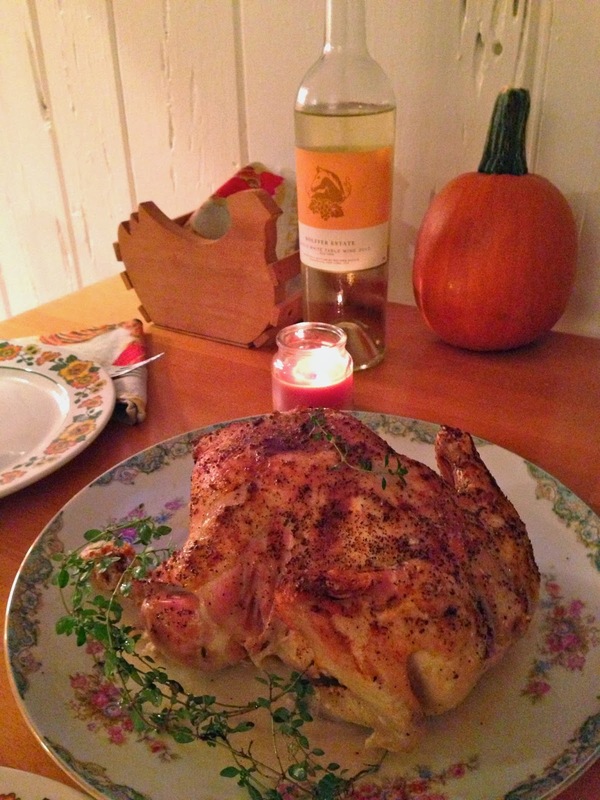 As the aromas of fall cooking fill your house, pour yourself a crisp glass of white wine and kick back for a bit. It's Sunday. And I'll bet that a slow grin may just creep across your face because you know that you're about to be everyone's dinner hero. 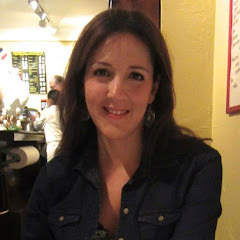 "A beautiful woman cooking mouthwatering food in a gorgeous French farmhouse? Don't hate Mimi Thorisson: just follow her tips on how to throw a picture-perfect dinner party sans stress." Intrigued, I knew I needed to learn more about this mysterious Mimi. Turns out, her hosting and cooking philosophy mirrors my own. Mimi Thorisson is the creator of the most gorgeous site, Manger. The only thing more beautiful than her food itself is her real life in Médoc,France where she writes vividly about combing the local markets and foraging the land for the inspiration for lovely French-centric recipes. A further look at this blog is peppered with stories like Mimi biking home from the market and through the forest where she comes upon the first-of-the-season cepe mushrooms. You'll also enjoy her colorful recollections of sumptuous outdoor fêtes showcasing the finest in local ingredients through her elegant dishes. Mind you, despite her busy life with multiple children and dogs (something like 14! ), Mimi remains positively elegant thanks to an enviable figure and fashion sense. Do I hate her? Not in the least. But as a lifelong Francophile myself, I admit to some slight envy... after all, this woman is living my dream life. Would I like to "borrow" her wardrobe and also be blessed with her seemingly effortless patrician elegance? But of course! 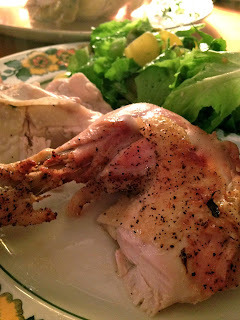 Mimi's Milky Chicken seemed like the perfect dinner choice because it called for just a few ingredients. Poaching a whole chicken in milk and water before roasting it with some of the cooking liquid makes for an ingeniously easy yet extremely moist and tender bird. This recipe's delicate flavors do not compete with the meat itself, so buying a high-quality bird is important. Organic chicken is more expensive, but in this case, it is definitely worth it if you can splurge. If not, this will still be delicious. To enhance the original recipe, I added some optional fresh thyme to the braising liquid, and bathed the bird in quite a healthy sprinkling of paprika - easily one of my favorite spices - to add a little extra depth and interest. The resulting dish did not disappoint, and was positively delicious next to a simple salad of field greens and yellow cherry tomatoes. While your chicken is cooking, you'll have plenty of time to prepare dessert. 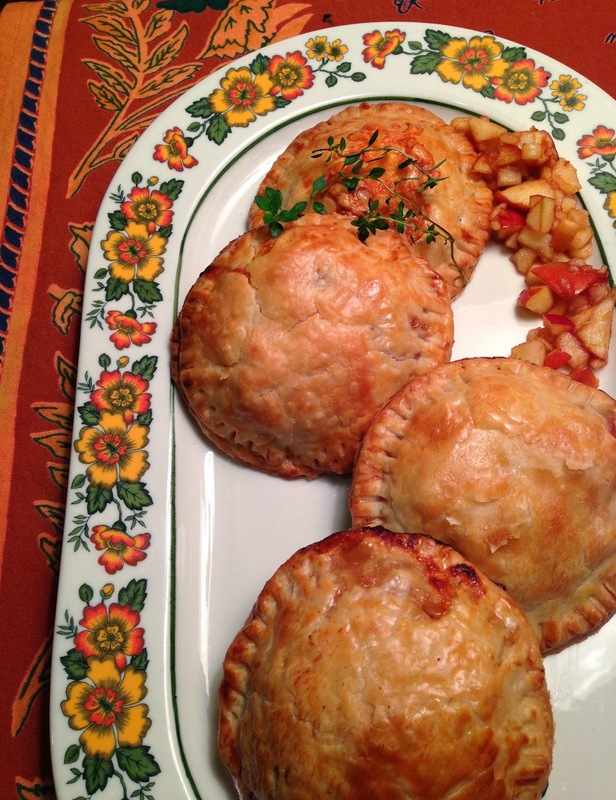 The idea for our incredibly easy Apple Cheddar Hand Pies comes from the classic combination of apple pie served alongside a piece of cheddar cheese. Just assemble the pies, remove your chicken from the oven and bump up the temperature to 375. When the oven's ready, pop these guys in for the next 23-25 minutes. By the time the pies cool a bit, you'll be ready for dessert. Why apple and cheddar? Well, for all you sweet and savory fans, this not-too-sweet yet still satisfying dessert is a great way to use peak season tart apples. Since I so rarely bake and am not naturally adept at it, you can be sure this recipe is foolproof. Just a bit of cheddar goes a long way, and while it nicely rounds out the sweetness of the apple, it is, in itself, not immediately detectable. You could play around with the cheddar to apple proportions to make this more savory. As usual, I will be using some baking shortcuts, which in this case take the form of Pillsbury roll-out refrigerated pie dough available where they sell slice-and-bake cookie dough. Special thanks to my Mom-in-Law for introducing me to this stuff. It is really good...the perfect Sunday (or any day) baker's helper. These little pies are also a fun idea for a cocktail party dessert, if I do say myself. Bonus - they'll make your house smell like everything good about fall. 2. In a large pot, bring the milk and water to a boil with several sprigs of thyme. Place the chicken in the pot and poach for 15 minutes over a medium flame. 3. When chicken is finished poaching, carefully remove it to a roasting pan and pour about 2 ladles of poaching liquid over it. Sprinkle the bird very generously with salt and black pepper, inside and out. Pat the paprika onto the chicken as evenly as possible, covering as much of the bird's skin as you can. Add a bit more if you prefer. 4. Now place chicken in the oven to cook for 45 minutes. Add about 3 more ladles of poaching liquid to the bottom of the roasting pan throughout the cooking process (I added 1 ladle every 15 minutes). 5. Once you've hit the 45-minute mark, turn up the oven to 350 and cook another 15 minutes more until chicken is crispy and golden. The chicken should be finished but you can check it by piercing it to make sure the juices run clear. Allow it to rest for a few minutes before garnishing with thyme, carving and serving. Voila! 1. Preheat the oven to 375 with a rack in the middle. 2. In a small bowl, combine chopped apple, sugar, cinnamon and lemon juice. Stir. 3. Grease a baking sheet with butter. 4. On a clean surface, carefully lay out two rounds of Pillsbury Refrigerated Pie Dough. Using a 3 inch cookie cutter (or mouth of a large juice glass) press out 12 circles of dough and remove the excess dough for another use. 5. Paint 6 of the 12 dough rounds with beaten egg and sprinkle the middle of them with a few small pinches of cheddar. 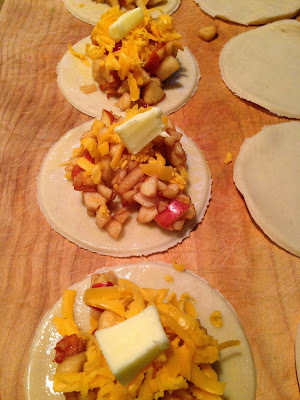 Top the cheddar base with one heaping Tablespoon of the apple mixture. Finish with another more generous pinch of cheddar on top of the apple mound and finish with one cube of butter per pie. 6. Now you are ready to finish assembling your pies. Use the remaining six rounds of dough to close each pie, one by one. 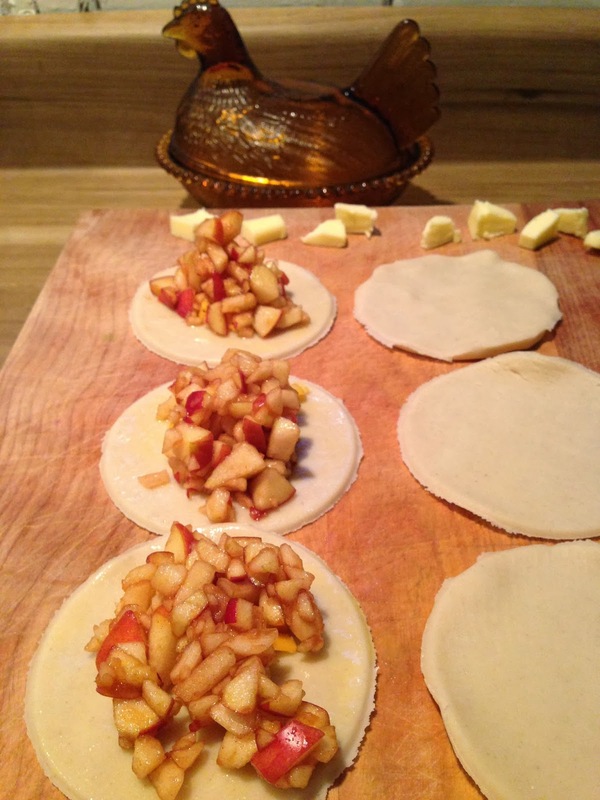 To do this, stretch the rounds in your hand ever so slightly, and drape them on top of the apple and cheddar mound. Pinch them closed at the seams, pressing down with your fingers to seal. Do this step gently so you don't tear the dough. For any minor tears, just pinch dough back together with your fingers. Once finished you can work around the edges of each pie with a fork, carefully fluting the edges. 7. Once all six pies have been assembled, paint the tops of them with more beaten egg. If you don't have a pastry brush, dipping a folded paper towel in the egg was works just fine. 8. Ok - You are ready to bake! Pop these babies in the oven for 23 - 25 minutes until golden brown and flaky. Allow pies to cool a bit and serve warm. I hope you enjoyed our easy and cozy fall dinner as much as we did. May your lazy Sundays be delicious too!